After Haiti's 2010 earthquake, over half of U.S. households donated to thousands of nongovernmental organizations (NGOs) in that country. Yet we continue to hear stories of misery from Haiti. Why have NGOs failed at their mission? 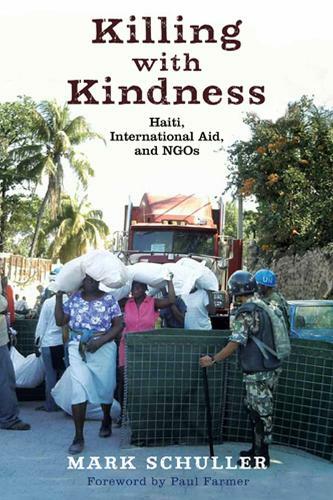 Set in Haiti during the 2004 coup and aftermath and enhanced by research conducted after the 2010 earthquake, Killing with Kindness analyzes the impact of official development aid on recipient NGOs and their relationships with local communities. Written like a detective story, the book offers rich enthnographic comparisons of two Haitian women's NGOs working in HIV/AIDS prevention, one with public funding (including USAID), the other with private European NGO partners. Mark Schuller looks at participation and autonomy, analyzing donor policies that inhibit these goals. He focuses on NGOs' roles as intermediaries in "gluing" the contemporary world system together and shows how power works within the aid system as these intermediaries impose interpretations of unclear mandates down the chain-a process Schuller calls "trickle-down imperialism."